The South 15-501 Discussion Group will meet Wednesday, March 21, 8-10 am at 105 Market Street, Rooms 3 & 5 Chapel Hill, NC 27516. This is a link to a binder of information related to this area. 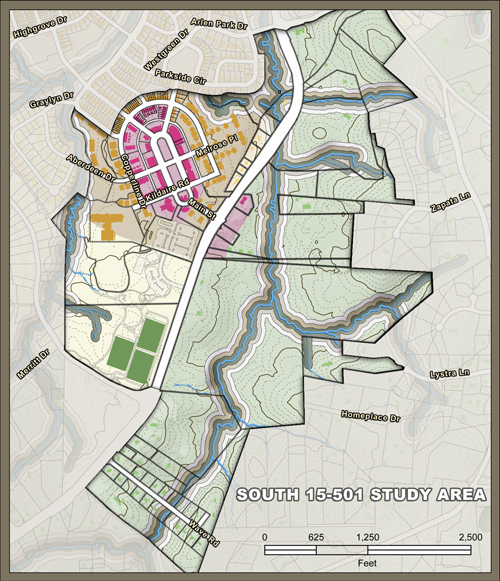 Specifically, what steps are you taking to ensure that the opinions of nine selected and not nominated people in the 15-501 South discussion group will not create a de facto Southern Area Small Area Plan? This group does not represent the citizens’ viewpoint. This group represents the opinions of only eight citizens and the Obey Creek developer’s son. I’ve attended two of the 2020 discussions about south 15-501, but find two issues not adequately addressed. 1) Make the best use of what you already have: Univesity Mall is woefully underdeveloped in terms of sales tax per sq.ft of retail. It simply fails to draw traffic. Likewise the “movie theater” on Elliott. Use what you already have for a much better yield. 2) Wal-Mart is a done deal and effectively an anchor at the county line. Build retail to leverage wal-mart inot New Hope Commons at the county line. 3) Leave Obey creek to low density development as previously promised.